We are in the age of content. We are creating and sharing, expanding and still expanding. It is impossible to streamline all these advancements that are taking place at a blinding pace without a defined method. From what is being created and noticed every day, there is a vast amount of knowledge waiting to be discovered. It is amazing to note how day to day advancements are revealing mind-boggling insights into patterns, that are currently being used to predict trends based on intense studies and exercises that are no child’s play. Welcome to the world of Analytics! Come 2015, the world is poised to witness $ 5.6 billion worth of opportunities, with the analytics market in India touching the $ 1.15 billion mark with five major acquisitions. This comes at a time when the generated data is growing at an exponential rate and the requirements for managing it are increasing similarly. This indicates a huge opportunity for a country that boasts of an enviable talent pool: India. In such a scenario, it only makes sense to hear what budding managers who are a part of this talent pool, and shall soon contribute to furthering these advancements, have to say. 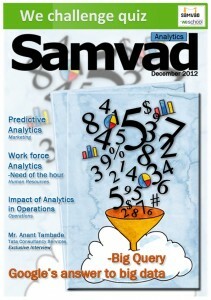 The December issue of Samvad shall ensure you have this, and much more. Two of the sectors that have begun the trend of relying on analytics in India have been the banking and financial sectors. This trend is witnessing a change with other sectors joining in. You shall read how analytics is helping financial institutions, in all possible ways. Analyze the performance of IPOs in India and gain a wide understanding of the field of Risk Analytics. In a field that was largely utilized for activities like prediction and analysis, a game-changing revolution is taking place with the inclusion of Human Resources. Learn how analytics is being used here to drive organizations. Understand the real-world problems data managers have to face with a piece that discusses Big Data. Predict the impact of analytics in the retail sector and its advantage to existing supply-chains. Also, gain an insight into the most revolutionary company to make use of analytics- Google. Featured along-with is an exclusive interview with Mr. Anant Tambade. Read the interview to find out the emerging role of analytics, scope for future managers in this field and what is it that you should have to be successful in this field. We invite you to send in your entries for the WeChallenge section, as a continuation of the overwhelming response we get every time. We shall be eager to know how you found the issue. Please feel free to write in with your valuable comments.